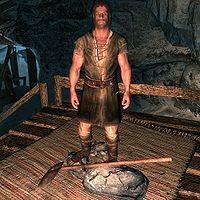 Pactur is a Nord citizen who, with his wife Sorli the Builder, runs Rockwallow Mine in Stonehills for Bryling. He'll ask you to relay a message to Bryling on their behalf. With Gestur Rockbreaker keeping an eye on the workers in the mine, Pactur spends most of his time inside the house with his wife and son. He sleeps between midnight and 7am and only has two errands during the day; at 9am he spends two hours standing outside the house, and at 1pm he pays a three-hour visit to the workers in the mine. At all other times he will relax in the house. He changes his routine drastically when the Stormcloaks take over Hjaalmarch and leave his and Sorli's son Sirgar in charge at Stonehills. He wears a set of clothes and boots and has an iron dagger equipped. He carries the key to Sorli's House, a belted tunic, and a selection of common items and gold. When approached, he will greet you with, "Sorli and I are just here to make sure the mine is run proper. ", "Wouldn't ever have expected to wind up living in a place like this, but the money's good." and "Don't bother the miners. They've got work to do." If you point out that he is living in the middle of nowhere, he will agree: "Don't have to tell me twice. But then, I'm not the one that buried iron under these mountains." If you ask him if he owns the mine, he will quickly say: "No, and before you ask, it's not for sale." After this response, you can choose between two different options. If you remind him that you weren't even asking, he will tell you about Thane Bryling, his real employer: "I'm just protecting Bryling's investment. She's the owner, even though we're the ones here doing all the work. She's already come down hard on us for missing shipments. Likely to do it again, since we're late." If you instead ask him if he gets a lot of offers, he will admit:" Well, no. But that's not the point. Bryling owns the mine, and she's not selling. We make her some decent coin running this place. Keeps her living well in Solitude. At least, when we can get shipments to her. We're late on the last one. I expect her to start breathin' fire any moment now." Once again, two options are available, both of them leading to Pactur asking for a favor, in exchange for a reward. If you ask him why he doesn't confront her himself, he will say: "Can't do that and keep an eye on things here at the same time. But... You could take word to her in Solitude, let her know it'll be coming soon. I'd make it worth your while. No one would notice a few missing ingots out of the next shipment." If you offer to help, he will make the same offer: "You could take word to her that there'll be a shipment soon. Buy us some time and keep her off our backs. In exchange, I'm willing to let a few ingots go missing. Maybe more than a few." If you say you will help him some other time, he will be disappointed: "Won't be 'some other time' at this rate." If you agree to help, he will be happy: "You're doing me quite a favor. I won't forget it." He will bid you farewell with a comforting: "I'm sure she'll be angry. Brace yourself." If Sorli becomes Jarl, Pactur will become her steward and will greet you with "It's good that Sorli has finally been given some real authority." On his new role he informs you "I'll see to it that Sorli is safe now that she's running Morthal." and that "We left Sirgar in charge back at Stonehills. I hope that wasn't a mistake." If the Stormcloaks take over Hjaalmarch as part of the civil war, Pactur's wife Sorli will be appointed the new Jarl and will move to Morthal. Although Pactur is meant to serve as her steward, she will only bring mine worker Teeba-Ei to Morthal, leaving Pactur in Stonehills. Despite staying there, his dialogue will change to suggest he is living in Morthal and serving as her steward. This bug is fixed by the Hearthfire add-on.